La Bodega de Chema se forma de la necesidad de un lugar para la educación y la distribución de la cerveza artesanal. Su fundador, Josemaría Mora, conocido como Chema por sus amigos descubre el mundo de la cerveza gracias a la oportunidad que tuvo de estudiar en Rochester NY. En Rochester, junto con sus amigos empiezan a probar los diferentes estilos y rápidamente las vacaciones se planean alreadedor de visitas a microcervecerias. Chema obtiene su primer trabajo como ingeniero en Watertown NY, un pequeño pueblo a solo 50 km al sur de la frontera con Canada. En Watertown era un pueblo pequeño con limitada selección de bares pero con ilimitada seleccion de cerveza en ellos. A finales del año 2010 Chema vuelve a Costa Rica con mucho entusiasmo pero con cierta melancolía de dejar el mundo de cerveza y entrar a un país con selección limitada. En un viaje a la playa se encuentra con una tienda de souvenirs que promociona la cerveza artesanal de Costa Rica. Incrédulo, prueba la Segua, y en ese momento el sabía que había esperanza para Costa Rica. En Abril del 2011 visita la Cervecería Artesanal de Costa Rica por primera vez y realiza su primera compra de una caja mixta de Segua y Libertas. Rápidamente, Chema involucra a sus amigos y comparte la cerveza con ellos. "Enseñarle a mis amigos a conocer la cerveza artesanal es una experiencia que quiero repetir con todos los ticos". 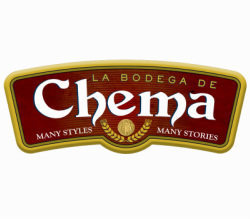 El 6 de Noviembre del 2011, La Bodega de Chema es inaugurada como un lugar para aprender, reunirse y adquirir diversidad de cerveza. El 31 de Octubre del 2014, Chema se certifica como el primer Certified Cicerone en el pais. But Perro Vida is more than a catchy trademark: Founded last year by three beer enthusiasts from the United States, Perro Vida has become one of the fastest-growing microbreweries in the country. This weekend Perro Vida will throw a party at Hotel Pelicano on Playa Esterillos Este to celebrate their whirlwind first year in business. This family-friendly event will showcase Perro Vida’s five different beers and include beach games and activities. Perro Vida was a most unlikely operation: Paul and Jessica Peck had visited Costa Rica on vacation and flirted with the idea of moving here. They were based in California, where Paul worked as a civil engineer and owned his own business. Paul had a passion for craft beer and made batches at home. They were on the fence about their dream of becoming expats, partly because neither of them spoke fluent Spanish. Then something strange happened: A man living outside the Pacific coastal town of Dominical had been in the process of building his own brewery, and he had invested in expensive new equipment. However, the man had a rare blood disorder and unexpectedly died. His tragic passing occurred while his equipment was en route to Dominical. Through a twist of fate, the man’s family contacted the Pecks and offered to sell them the equipment, which had yet to be claimed from the postal service. The Pecks accepted the deal, paid $1,000 in duty fees, and started puzzling out the sophisticated new gear. They had never used such high-end equipment before, so they had to experiment. “We had to figure out how to put the fermenters together,” remembered Jessica. Paul developed a recipe and brewed a substantial amount of beer; the Pecks debuted the first Perro Vida samples at the 2012 Craft Beer Festival at Avenida Escazú, southwest of San José. Perro Vida has always been recognized for its bold flavors and hoppy finish. Peck prefers IPAs, which boast a taste and body far more dense and powerful than Imperial, or even many other craft beers. Peck’s concoction instantly attracted fans, and they asked where they could find more. The Pecks were excited to have made a good impression, but they had hit a wall: Perro Vida was not a licensed brewer. They were, legally speaking, only amateurs. Then there was another burst of kismet: Last September, the Pecks visited the Pacific coast and met two other men from the U.S., Kyle Kersey and Mick Gutierrez. Kersey and Gutierrez already knew each other and lived near Manuel Antonio, where they had yearned to start their own brewery. Given their shared dream, Peck, Kersey and Gutierrez decided to become partners in the Perro Vida business. This weekend’s party celebrates that chance meeting in 2013. In the 12 months since then, Perro Vida has grown exponentially. They opened the brewery in a small building in Rainmaker Park, a natural preserve near the town of Parrita. They now provide beer for eight different restaurants and bars – including Craic’s Irish Pub in San José, The Green Room in Jacó, and Barba Roja in Manuel Antonio – and Jessica estimates that 25 more venues have actively sought out Perro Vida kegs. They credit their fellow craft brewers at Treintaycinco for helping them in innumerable ways, including providing paperwork advice and even sharing their delivery vehicles. In keeping with this exciting new customer base, the Pecks hope that their anniversary party will draw more Costa Ricans. Jessica has been busy putting up posters in bars and restaurants along the Central Pacific coast. She would like to see at least 200 people, especially folks from San José. And where does that name come from? “I’m one of those freaky dog women,” said Jessica. She added that the names of Perro Vida’s beers were inspired by canines, such as “Massive Mastiff” and “Diogenes,” the name of the Greek philosopher who claimed that dogs have the best lives. The Pecks’ home near Ciudad Colón is a magnet for dogs. How many are permanent residents? The Perro Vida anniversary party takes place Sept. 27 at Hotel Pelicano, Playa Esterillos Este, Puntarenas Province. 12-6 p.m. Info: Hotel Pelicano website.